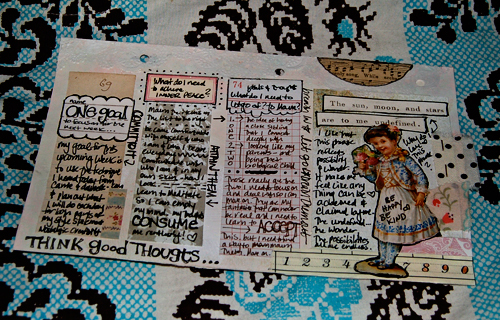 Here it is another week gone by already... for my journal pages this week I did a few different things. I made a page to write out what I think defines me - but I never filled it out... I also have a section about what I WANT to define me. Hopefully next week I will fill it in. On the right is my would be tree - it is the family tree of my birth family. I wanted to record it so I had it to refer to if I ever want or need to in the future. I then decided to do my real family tree - so I did that, but I got so confused from all the emails and stuff from my parents that it ended up not being very colorful! But again, I wanted to record it so I have it for future reference. On the right is a half page I made with scraps left over from a fun crafting day I had with other like minded crafter's this week. You can also see a page I made for next week peeking through. The rest of the pages are ones that I showed you in my previous post before I journaled on them... so here they are finished. The list page was fun. I love lists. I listed the following: One goal to focus on for the next week, what I need to do to achieve inner peace, ideas/thoughts I have that I need to let go of and mourn, and then on the right I Wrote about why I love the words I pasted onto that box. I have had them sitting on my studio desk for ages and finally used them. They read, The sun, moon, and stars are to me undefined." I am happy with this page more so than any others this week. I wrote six of my most common, most negative thoughts and put them in the envelope I attached to this page and sealed it shut. 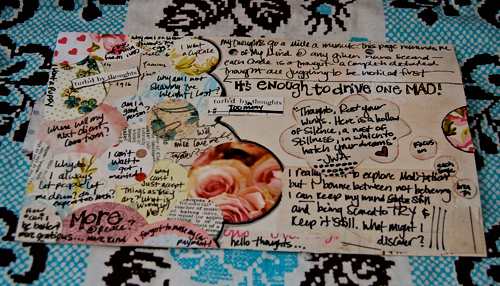 In doing so I banished these thoughts. I wrote about how when these thoughts come back I must envision my sealing them and banish them again and again until they never return. This circles page did not have a purpose when I created it. But I was looking at it and it reminded me of my mind and all the thoughts bouncing around non-stop all at once in there. So I wrote thoughts as they popped into my mind on some of the circles, and a quote and some text. At least I recognize the need to bring some peace to my mind and hopefully can take it a step further in the upcoming weeks. 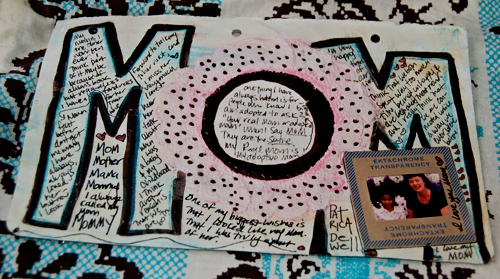 For my mom page- I wanted to talk about how close we have become over the last few years, and how much I love that. I used some new charcoal colored pencils I just got too (the pink and blue). I used a photo I just recently found of us from a childhood visit to Disney World. So that's my wrap up! Happy Weekend. 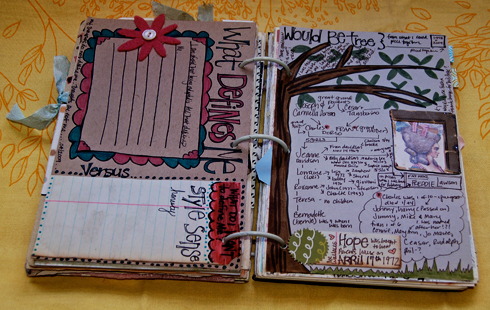 And what do you guys think of a giveaway of a journal I make custom for the winner? 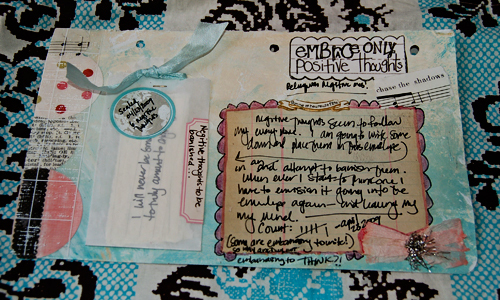 Postscript: Be sure to pop over to Pam's blog today for some journaling q & a from an expert! 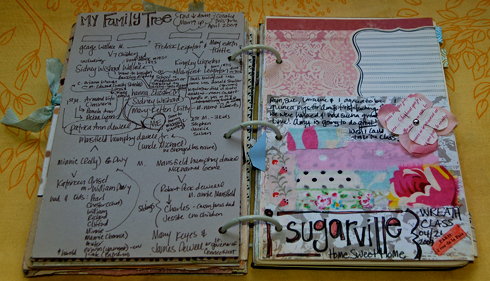 Those pages developed into yummy and deliciousness for the eyes. It's like peering into a vintage roll top desk with curious and compelling cubbies and secret drawers. And who wouldn't just die for an album from you? A home-made journal contest would be amazing. I want to be the journal gieaway winner!!!!!!!!! !